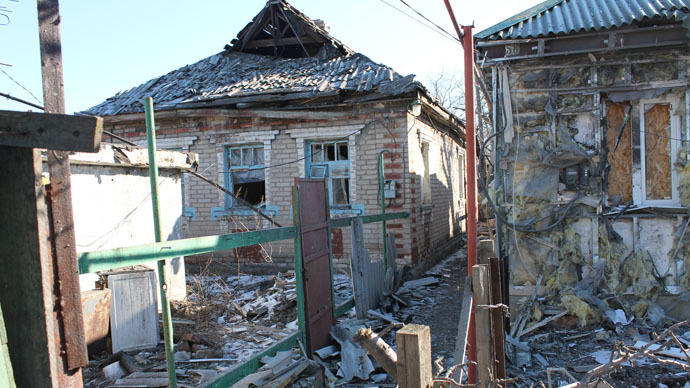 Three civilians, including a child, have reportedly been killed in eastern Ukraine after a shell fired by the Ukrainian military hit a residential area. Three people, including an 11-year old girl, her father and one more civilian have died in the town of Gorlovka, the Donetsk news agency reported, citing senior rebel commander Eduard Basurin. Four more people have been injured, including one serviceman, Basurin said. The shelling on Tuesday confirms Kiev has betrayed the Minsk agreements, by not removing heavy artillery from the region, Basurin said. "If the artillery were removed 50 kilometers as agreed, it could not have reached the town," the rebel commander told the Rossiya24 channel. Authorities in the self-proclaimed Donetsk People’s Republic informed the OSCE monitoring mission of the incident, Basurin said. He added that he expects the monitors to visit the site on Wednesday to view the aftermath of “the tragedy" and ascertain what military equipment was used in the shelling. According to recent estimates by the UN human rights office, over 6,000 people have been killed and over 15,000 wounded in eastern Ukraine during a year of fighting. However, the real numbers could be much higher. At least one civilian was killed in Donetsk a week ago, after an army shell hit an apartment building amid intense fire on rebel positions. Last week, the Ukrainian parliament approved a regulation that removed the obligation to protect certain human rights in the Donetsk and Lugansk regions. Kiev says "anti-terrorist operations" in the area override their obligations in this regard. The shelling comes amid a fragile ceasefire between Kiev and the Donbass rebels agreed in Minsk in February. Despite the agreements reached by the leaders of Ukraine, Russia, France and Germany, then called the "last chance" to bring peace to Ukraine, violence in the region has continued.